When toilet training your puppy, the most important rule that you need to remember is this: If you don’t catch him in the act, don’t punish him for it! Should you come across a mess that was left while you were gone, just clean it up and let it go. Discipline is useless because unless you catch your pup doing it, he will not know what he is being punished for. He has peed and pooped many times before he met you, and nobody has ever made a fuss over it before. Therefore, he will not be able to associate the punishment with something that he has done without incident hundreds of times before, especially if he did it over 30 seconds ago! Like children, puppies are not thinking about what they did before, unless it was really fun. They are thinking about what they can do next. 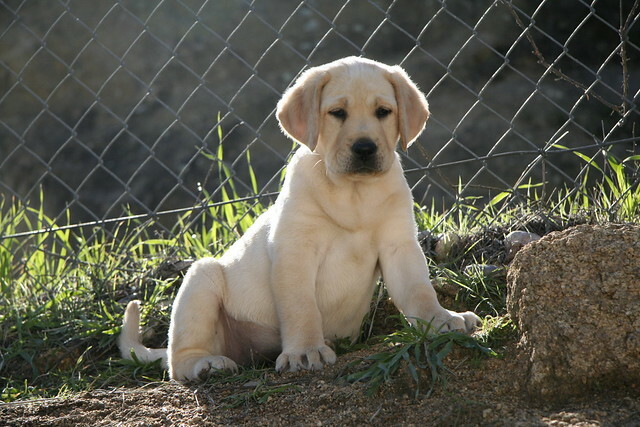 Young puppies have very poor memory. Moreover, you have to admit that it was your fault and not your pup’s. Had you been keeping an eye on him, you would have noticed that he suddenly started walking or running around in circles, sniffing for the right spot. Your puppy will display the same behavior every time he needs to go to the bathroom. The act may vary a bit from pup to pup, but they will always show their pre-potty pattern. Every action has an equal and opposite reaction (remember Newton? ), and this applies to dog potty training as well. If you overreact and harshly scold or scare your puppy for making what is in your mind a mistake, you will not be able to make much progress. Some people believe that rubbing a puppy’s nose into his mess will teach him a lesson, but this isn’t the case. In the puppy’s mind, there is no difference between rubbing his nose in the accident he left in your living room an hour ago and rubbing his nose in the pile the neighbor’s dog left in the park a week ago. Peeing and pooping are natural instincts, and punishment seldom speeds up the potty training process. Instead, it makes the dog nervous or fearful every time he has to relieve himself. Punishing your puppy can cause long-term relationship problems. If you discipline your puppy for making a mess while you were away, he isn’t thinking about what he might have done a couple of hours ago. He isn’t thinking that he should not relieve himself inside the house. He isn’t even thinking about the messes. If you get home and your puppy runs off and hides, he’s not doing it because he has had an accident. Instead, he has learned that when you first come home, you are always in a bad mood and he gets punished. Hence, your pup has decided to avoid you for a while and goes into hiding. Because discipline was misunderstood, your puppy becomes afraid of you, and this can have a lifelong impact on your relationship. Regardless of the method you use, spend as much time as possible with your pup if you want to accelerate the housebreaking process. Always keep an eye on your puppy and be there when you’re needed. You’ll be surprised at how much progress can be made in just one week. Next Next post: Are You Prepared for an Emergency?